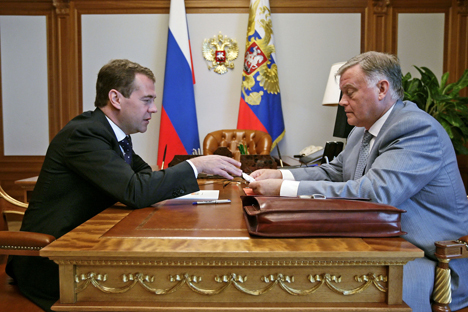 Dmitry Medvedev has signed an order instructing the top management of 29 state-owned companies to account for their income and spending. Economists are skeptical about the necessity and potential efficacy of the prime minister’s initiative. Russian Prime Minister Dmitry Medvedev has signed an order instructing the top management of 29 leading, state-owned corporations to account for their income and spending. The instruction will only apply to “those senior managers capable of being appointed by the prime minister,” Medvedev's press secretary, Natalya Timakova, told the media. Will anti-corruption campaign improve the business climate? In other words, the order will not cover a number of major state-owned corporations, including the world's largest oil company, Rosneft, Russia's second largest bank, VTB, and the gas giant Gazprom. The 29 companies to be directly affected by the government decision include Russian Railways, Moscow State University, the Higher School of Economics, Rosatom State Nuclear Corporation, ITAR-TASS news agency and several smaller businesses. These companies’ directors, their deputies and chief accountants, as well as their family members, will be required to declare their income and spending. Senior managers will be made to account for income accrued from all sources, including from their previous employment, as well as from pension and welfare payments and any other benefits. The declaration filed by managers should also include information about any property owned or leased. In the event that any part of the information provided proves to be false, the filing party will be given three months to re-submit their declaration. Sergey Prikhodko, deputy prime minister and government chief of staff, said at a Cabinet meeting that the veracity of the information submitted will be checked thoroughly and systematically. Yevgeny Yasin, head of research at the Higher School of Economics, dismissed Medvedev's move to "police" large corporations as "absolute nonsense." "You have set up a whole load of state companies and corporations, and now you want to police them in the same manner as you do officials; well, that's absolute nonsense," Yasin told the Russian news agency Prime. "You can tell Dmitry Anatolyevich [Medvedev] that he should not listen to all those people milling around him." According to Yasin, if the state wants to police the people who work for it directly, then it should set up state institutions; if, on the other hand, the state does not need this but has state enterprises, it should privatize them. Alternatively, Ilya Rachkov, a partner at King & Spalding, believes the taxpayers have a right to know how state-run companies spend the money they receive from the federal budget. "In this sense, we cannot but hail the government's initiative; however, top managers will always find 1,001 ways to [misappropriate] state funds," Rachkov said. For example, a senior manager may decide to register his or her property in the name of a firm that cannot be traced back to them. Others, however, note the jurisdiction of the prime minister’s initiative as problematic. "The fact that a number of state companies are actually exempt from this requirement fits in nicely with the concept of there being certain, privileged businesses that are, by definition, impeccable," said Ilya Levin at the Humboldt University of Berlin. Alexander Yermolenko, a partner at FBK Legal, believes the requirement that senior managers declare any transactions whose value exceeds their three-year income is altogether a pretense for fighting corruption.